Blue River Run Townhomes for sale in Silverthorne Colorado Real Estate are three story townhomes just north of Interstate 70 off of Highway 9 in Summit County. There are 81 Blue River Run Townhomes with 2-, 3-, and 4-bedroom floor plans. These Silverthorne townhomes range in size from 1,144 – 2,594 square feet. Built between 1998 – 2002 each property sits upon 0.02-0.11 acres. Each property comes with either a 1 or 2 car attached garage as well. Many Blue River Run Townhomes back to the babbling Willow Creek or they side the flowing Blue River. These beautiful townhomes in Silverthorne CO Real Estate have vaulted ceilings and several decks with either mountain or creek/river views. The Summit County Recreation Path travels through the property which is great for biking or taking an evening stroll. Blue River Run Townhomes homeowner association (HOA) dues are $345 per month and include common area maintenance, snow removal, cable television, trash pick-up, water and sewer. 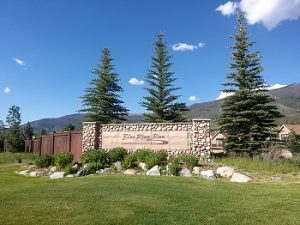 You can find these Silverthorne townhomes on Creek Lane, Mountain Vista Lane, Range View Circle, Rocky Run Lane and South Vista Circle in Silverthorne, Colorado. Arrange a private showing of the properties for sale in Blue River Run Townhomes in Summit County Real Estate today.